This lesson planner, AU, is remade in the V4 planners. The lesson plan fetching system is set at the S-Sheets in cell B3 and not at the AU planners. AU supports the number system but it does not use number system Dates. The planner date for AU is selected from a small range of dates instead of a gigantic list of dates. For this small range of dates, the day of the week is controlled by a drop-down list in cell M1. AU supports line breaks via the correct CHAR number. Settings at AU control most of the content in the rest of the AU planners – AUD, AUB, AUC3. Most of the set-up steps below are done once or rarely (as needed). Weekly usage of the AU lesson planner involves selecting the date. Except for the missing date/number system selections, the rest of the set-up is much like the Block, Daily, and List lesson planners. Place a “check-off” item ( an underscore or something else ) in the middle cell of the 3 small cells just above each group of year/student plans. Place a space or something else in the bottom cell of the 3 small cells just above each group of year/student plans. Date and Number systems are displayed on the planner, however; the system is set at the S-Sheets in Cell B3. 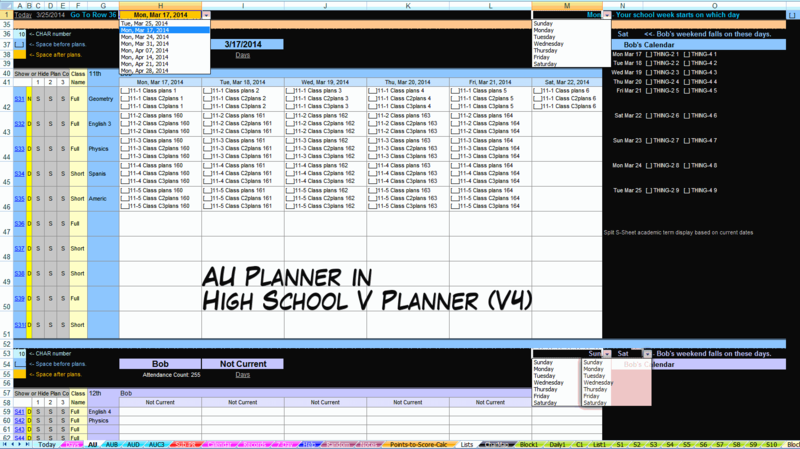 Using AU is the nearly the same in V Planner and High School V Planner. One difference is that in the High School V Planner, only one planner will be “current.” A formula in cell F1 will tell you which row begins the current lesson planner. Another different is the calendar box, there is only one and it is in cell P1. The image shown below is a screenshot of AU planner in the High School V Planner. Click the image to see the full sized image.